Wed, Jun 13, 2018, 06:35 pm SL Time, ColomboPage News Desk, Sri Lanka. June 13, Colombo: The U.S. Government's Millennium Challenge Corporation (MCC) Managing Director for Europe, Asia, Pacific, and Latin America Caroline Nguyen visited Sri Lanka from June 11 to 13 to advance the development of the proposed MCC compact - a large-scale five-year grant program. During the visit, MD Nguyen joined U.S. Embassy Deputy Chief of Mission Robert Hilton at the Ministry of Finance to sign an agreement to provide an additional 413 million rupees (USD 2.6 million) grant to finalize compact development. Secretary to Treasury and the Ministry of Finance and Mass Media Dr. R. H. S. Samaratunga signed the grant agreement on behalf of the Sri Lankan government. Deputy Chief of Mission Robert Hilton said the Millennium Challenge Corporation compact is an important part of the U.S. government's commitment to work as partners with the people of Sri Lanka to support sustainable development throughout the country. 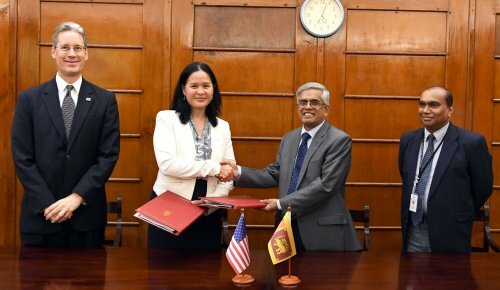 "We are pleased to partner with Sri Lanka on a program that will reduce poverty through economic growth and improve lives in the country," Nguyen said. "This additional funding will support the final stage of compact development and help ensure that the program will have the transformative impact that MCC and the government collectively seek." The proposed MCC compact is in the final stages of development and is expected to be presented to MCC's Board of Directors for approval by late 2018. MCC will fund the compact entirely through grants which do not need to be repaid rather than loans. Based on an analysis of Sri Lanka's economy and the constraints that are holding back private investment and growth, MCC expects to invest in projects proposed by the Government of Sri Lanka in the transport and land sectors. The proposed compact seeks to reduce urban traffic congestion, improve interregional movement of goods and people, and support government initiatives to strengthen land administration. In December 2016, MCC's Board of Directors selected Sri Lanka to develop a compact. Sri Lanka became eligible for assistance after passing 13 out of 20 indicators on MCC's policy scorecard.